This kit has all of the carriage bolts, nuts and special square washers to mount the bed strips. Made in USA. A complete set of bolts to anchor the narrow pickup bed to the frame. (Not for wide bed pickup). Made in USA. A complete set of bolts to anchor the WIDE BED pickup bed to the frame. This kit contains the following bolts: Box to sill, wood sill to metal cross member, wood sill to rear fender brace, wood sill to taillight bracket, tailgate hinge to cross member, and the box to rear cross member bolts. This Stainless Steel kit has all of the carriage bolts, nuts and special square washers to mount the bed strips. Made in USA. Tailgate Hinge Bolt for the 1928-31 narrow bed pickup. This is a special bolt. The set has bolt, castle nut and cotter pin. Made in USA. Tailgate Chain for the 1928-31 Narrow Bed pickup. The chain that support the tailgate when it lets down. Made in USA. Sold each. 1931-37 Ford pickup tailgate Chain. 1931 Wide bed Model A pickup. Chain Cover for the 1928-31 Pickup. These covers slip over the chains to prevent them from rattling and chipping the paint. Sold each. Made in USA. Tailgate Chain Hook for the 1928-37 Ford pickup. These links hold the tailgate shut. The chains are held on with these. Made in USA. Fit's narrow or wide bed. Chain Bracket for the 1928-31 pickup with the narrow bed. They mount on the bed, and the lock links to them. Made in USA. 1928-31 Steel Pickup Bed Strip Set with the mountiing holes already punched. 53" long to fit the 1928-31 narrow bed. Made in USA. 1928-31 Stainless Pickup Bed Strip Set with the mountiing holes already punched. High quality Bed Wood set for the 1928-31 (Narrow Pickup Bed). Made from quality hardwood and all precut with the grooves for the bed strips. Originally, the floor wood was painted the same color as the bed. Bed Wood for the 1931 (Wide Bed). Made from quality hardwood. This wood for the wide bed is actually the sub floor wood that goes under the metal floor pan. Made in USA. Tailgate for the 1928-31 (narrow bed) pickup. Just like Henry made'em. Comes with the mounting brackets. This early style has the Ford script and is licensed. Made in USA. Tailgate for the late 1931 (wide bed). Just like Henry made'em. Comes with the mounting brackets. Bed Sub-Rail set for the 1928-31 Narrow Bed. These are the metal parts that mount the bed to the frame. Wood sills go on them. Made in USA. Wood Bed Sills for the 1928-31 pickup bed. Hardwood pieces that go between the bed and the frame. Made in USA. Wood Bed Sills For the late 1931 pickup with the Wide Bed. Hardwood pieces that go between the bed and the frame. Made in USA. Wood Sill End Cap for the 1931 Wide Bed model. Metal caps that cap off the end of the wooden sub rail at the back of the wide bed. 2 required. Made in USA. Cross Channel set for the 1928-31 Narrow Bed. The rails that run cross-ways under the bed. Made in USA. 1931 Wide Bed Centre Cross Channel. The rail that run cross-ways under the bed. Made in USA. 1931 Wide Bed Rear Cross Channel. The rails that run cross-ways under the bed. Made in USA. 1928-31 Centre Pickup Bed Plate for the Narrow Bed. The heavy steel plate in the centre of the bed. Made in USA. 1928-31 Narrow Bed Sub Rail Bracket Set. A pair of these are needed for the bed. They attach to the sub rails, and support the wood sub rail. Made in USA. Cargo Strip set for the 79A Panel Delivery. Set of 4 metal strips used in the cargo area of 1928-29 panel delivery. Correct contour with holes punched. Made in USA. Cargo Strip set for the 79B Panel Delivery. Set of 4 metal strips used in the cargo area of 1930-31 panel delivery. Correct contour with holes punched. Made in USA. 1928-30 130A Cargo Strip Set. Set of 4 metal strips used in the cargo area of 1928-30 deluxe delivery. Correct contour with holes punched. Made in USA. 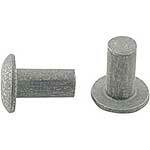 If you have the late 31 wide bed, this is the screw kit that screws the tin floor in place. Made in USA. Pair of Front Bed Stake Pockets for the narrow bed. Made in USA. Wide Bed Stake Pocket for the front of the bed. 1931 wide bed only. Made in USA. Wide Bed Stake Pocket for the rear of the bed. 1931 wide bed only. Made in USA. The rear part of the pickup bed U-channel is often rotten. Instead of replacing the entire U-channel, you can replace the center portion only by welding this in place. Includes the Z' panel. Rear U-Channel for the 1928-31 pickup with the narrow Bed. This is the rear part of the bed that tail gate brackets hook to, and it is also the rear stake pockets. Front Bed Panel for the 1928-31 with the Narrow Bed. Very nice repo with the top corner tabs already installed. Made in USA. Front Bed Panel for the 1931 Wide Bed pickup. Very nice repo with the top corner tabs already installed. Made in USA. (Narrow bed pictured). Z Shaped Panel for the 1928-31 with the narrow bed. This panel goes at the rear of the bed, and the wood sets on it. Made in USA. Rear Fender Spacer set for the 1928-31 pickup. These go between the rear fenders and the bed. Made in USA. Stake Pocket Cover set for the 1928-31 pickup bed. These go on top of the bed sides where the stake pockets are. Need 4 per bed. Made in USA. Used on narrow bed only. Tailgate Hinge Set for the 1928-31 Narrow Bed pickup. 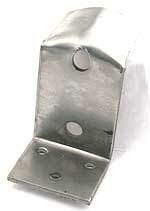 These hinges mount on the rear U-channel, and they are the brackets that the tailgate hinges to. 4 peice Set. Made in USA. Tailgate Hinge for the 1931 wide bed pickup. You will need 3 of these for attaching the tailgate to the bed. Made in USA. 1928-31 Station Wagon Chain Cover . These covers slip over the chains to prevent them from rattling and chipping the paint. Made in USA. Chain Bracket for the 1931 pickup with the wide bed. They mount on the bed, and the lock links to them. Made in USA. 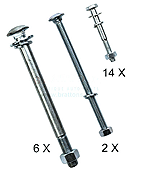 (Narrow bed bracket shown). Bed Rivet set for the 1928-31 pickup with the narrow bed. A complete set of rivets for assembling the pickup bed. Bed Rivet set for the 1931 Wide Bed pickup. A complete set of rivets for assembling the pickup bed. Wooden side boards for the narrow bed. Will not fit the late 31 wide bed. Made of good hardwood. Made in USA. This panel bolts to the frame between cab and bed. Lip sticks up between bed rails to keep cargo clean. Made in USA. Bed Panel for the 1931 Wide Bed pickup. This panel bolts to the frame between cab and bed. Lip sticks up between bed rails to keep cargo clean. Made in USA.